Outspoken, honest, game changing—ultimate soccer insider and legendary coach Bruce Arena looks back on an extraordinary career, and forward to what the United States needs to do to compete successfully on the world stage once again. At around 8:37 p.m. EST on October 10, 2017, an unheralded Trinidadian right back, Alvin Jones, received possession of the football in a World Cup qualifier against the United States. Looking up, he took one touch and unleashed an extraordinary shot toward the American goal. No one in the stadium—least of all US coach Bruce Arena, standing ten yards away on the touchline—thought the ball would hit the back of the net. But hit the back of the net it did. And so, on that fateful muggy night at Ato Boldon Stadium, in Trinidad, Alvin Jones doomed the United States to miss the World Cup for the first time in thirty-two years. Cue hand-wringing and moans of pain from the legions of US Men’s National Team fans. With that ultimate 2–1 defeat and ouster from the World Cup, American soccer realized it had to take a long, hard look at itself. In What’s Wrong with US?, Bruce Arena begins that painful but much-needed process. Arena has won everything there is to win in sports, including college championships and Major League Soccer triumphs—he has even excelled as a coach of lacrosse, his first passion. His 2002 World Cup soccer team came a non-called handball away from the semifinals; and, having worked with the likes of David Beckham, Landon Donovan, and Christian Pulisic, he has had a storied life as a coach. Now, though, it’s time to take stock and have an honest discussion about what’s wrong with soccer in the United States. 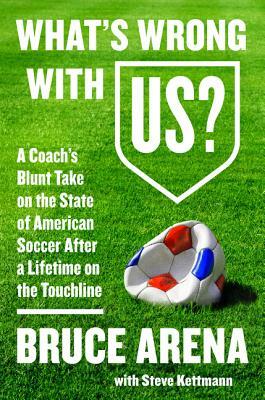 Arena casts his eye on recruiting, coaching, the structure of Major League Soccer, the integration of overseas players, and the role of money in the modern game. He looks back at the 2018 qualifying campaign, reveals what went wrong, and looks forward to a new way of soccer in America. Bruce Arena is the winningest coach in US soccer history. As head coach at the University of Virginia, he led the Cavaliers to five ACC Tournament Championships and five National Championships. Arena first became the head coach of the US Men’s National Team in 1998, is the first coach in history to win three CONCACAF Gold Cups, and has coached teams to five MLS Cup championships. A member of the National Soccer Hall of Fame, Arena has thrice been named the MLS Coach of the Year, and in 2014 he received the Werner Fricker Builder Award, the highest honor that an individual can receive from the US Soccer Federation.